How cute!! 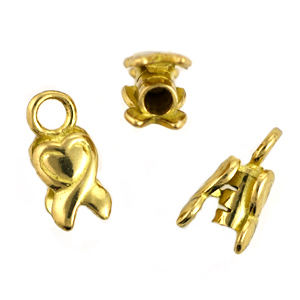 Bright Brass End Cap with Heart. Measures approximately 12mm (from top of attached ring to bottom) x 5.5mm at widest part. Attached ring inner dimension is 2.5mm. Inner dimension of center wire/cord hole is 2.25mm. There is a small bar in the center of one of the hearts, so when gently pushed closed, it will push into the center tube and slightly crimp it.